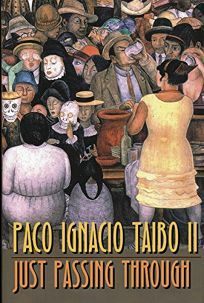 As an activist in Mexico in the '60s, Paco Ignacio Taibo II began a search for figures in leftist history that his generation could look up to. Today an internationally famous detective novelist (An Easy Thing, etc. ), the writer has validated his quest with a novel-documentary, in which he reimagines a historical figure--a mysterious Spanish anarchist named Sebastian San Vincente. Casting himself in a tale set 29 years before he was born, Taibo chronicles his present-day research and depicts a range of first-person characters (some of them real figures) who engage with the elusive anarchist. His first creation is a 16-year-old orphan called Pablo, who meets San Vicente as the anarchist arrives in Tampico from the U.S. in 1920. On the run from the FBI, San Vicente immediately plunges into revolutionary agitation in the port city, supporting himself as a mechanic. Taking Pablo under his wing, he initiates the boy into the mysteries of engine repair and the writings of the revolutionary Bakunin. But soon San Vicente makes his way to Mexico City, where he falls in with the CGT, an opposition labor union. Narrowly escaping an assassination attempt (the would-be assassin is another first-person Taibo elaboration), he becomes a secretary for the group. In 1921, he is arrested with an American Communist, Richard Francis Phillips, and deported to Guatemala. But San Vicente is soon back in Mexico, where more activism and a final arrest result in his deportation to Spain in 1922, marking his last appearance on the historical record. Incorporating historical documents or documents based on fact--letters, telegrams, police files, etc.--the author further blurs the boundary between fact and fiction. Taibo's affectionate account of working-class culture in a phase of heroic struggle is a perfect little jeu d'esprit. (Feb.) FYI: This book was originally published in Mexico in 1986 as De Paso.